Living in the vibrant shopping district of Calle Fuencarral means walks past chic boutiques, designer stores and quaint Spanish balconies. For nearly the past two weeks, my daily walks have also included dodging thigh-high piles of trash, kicking broken beer bottles and watching the ballet of plastic bags and paper waste float through the air in the breeze. It’s clear I’m not in Kansas – make that squeaky-clean Celebration, Florida – any more. 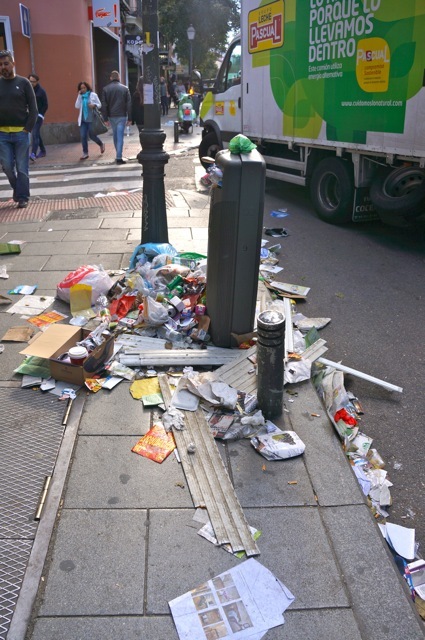 A strike in Madrid by city sanitation workers has entered its eleventh day. 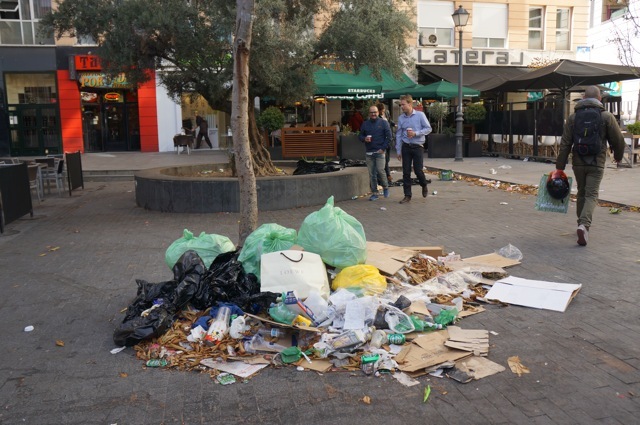 While trash is still being collected, the street sweepers have stopped working, protesting a job elimination announcement made by the private contractors that employ many of the city’s sanitation workers. The contractors recently threatened to lay off more than 1,000 employees, nearly 1/6 of the industry’s workforce. Madrid seems big on strikes, or huelgas. In the past two months alone there have been strikes for teachers and transportation employees. 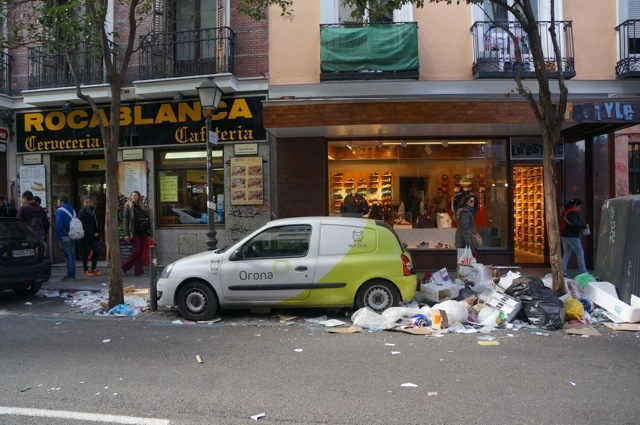 Residents of Madrid are growing tired of the trash pile ups and hope the government will take action to keep the streets clean. According to MSN News, more than 30,000 people have signed a petition asking the defense minister to take action. I’m personally baffled the strike has gone on so long and will be quite curious to see how it all turns out. 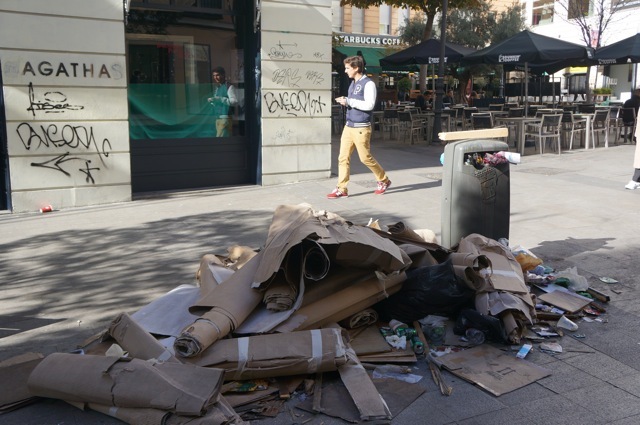 Local shop keepers sweep the areas in front of their shops so there is room to walk and so far the stench isn’t that bad. For now I will just enjoy the change in scenery and enjoy the entertainment of passing bizarre objects such as boots, bras and wigs, on my way to the metro, all while holding my nose to ignore the strange stenches.